According to various media and Noonsite, the new cruising tax will be introduced in Greek waters in 11 days, starting April 2, 2019. As our Dekpa expires at the beginning of April and we have a lift, we try to take care of the bureaucratic ways today. 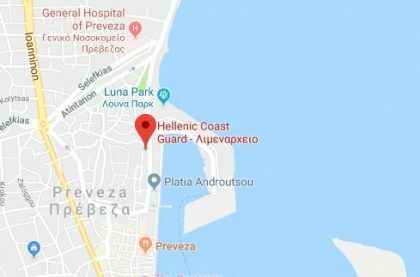 Arrived in Preveza we find the somewhat hidden the Port Police (behind the post office). Here we just need to get a stamp. Quickly we get up to the first floor. The officer obviously wants to see our existing Dekpa – and the insurance documents. In 2018 we adapted our policy for Greece. 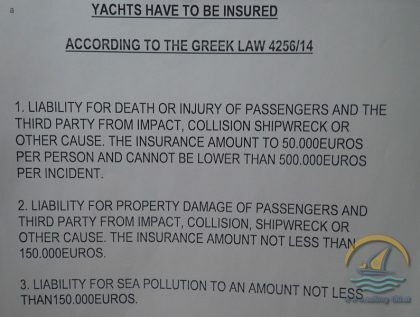 At that time it was important that the total insurance sum of EUR 7.000.000,– was shown, the certificate had to be international (so multilingual, best not only English, but also Greek) and had to contain the note “According to Greek Law 4256/14”. 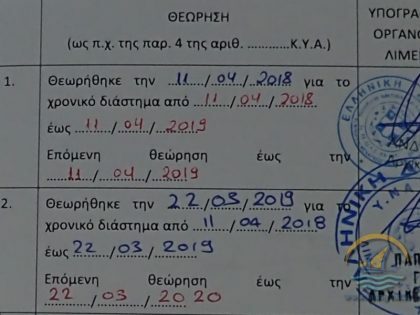 That was 2018.
the Greek law 4256/14″ We did not know that. Probably we are not the only ones, therefore I write this article on Tiki directly after returning. Exact details can be found in the document, which was handed out to me in Preveza. The officer was eager, but the superiors were not very cooperative, although the sum insured was considerably higher than necessary. 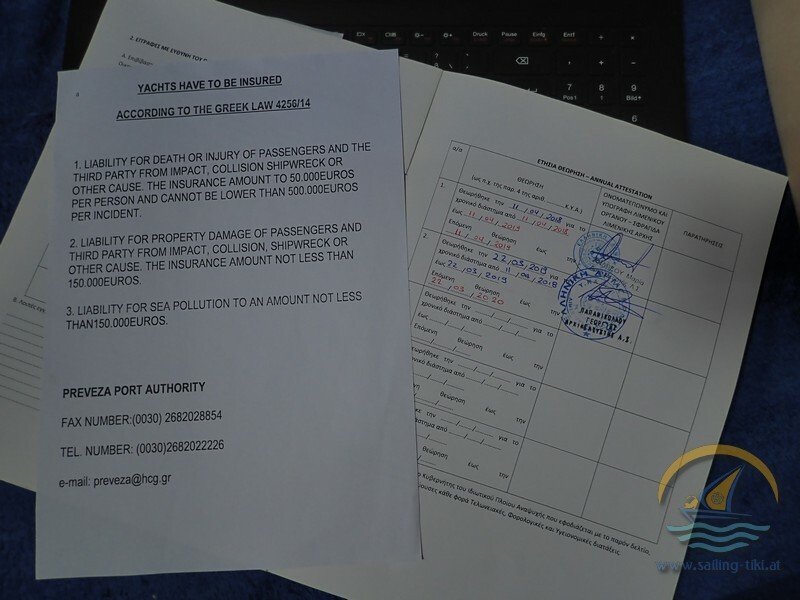 The situation was aggravated by the fact that there was an error in the term of the insurance policy, the date was not changed from 2018 to 2019 when the policy was renewed. However, the certificate is correct and we are trusted, but it does not help. As far as the new tax is concerned, he only knew that it is valid from 2 April 2019, he could not tell us any further details yet. Thanks to Wolfgang, the owner of the shipyard where we worked ourselves half dead last summer (on our own boat of course) we get to Lefkas in time. Here you go at the city pier into the building with the sign “Chamber of Commerce” and find on the first floor on the right, at the end of the corridor a small office with 3 officials. In the meantime I got a policy from the insurance company with the correct duration by mail, the official is not bothered that he has to look at everything on my mobile phone display, here the note “According to…” is enough and we get the coveted stamp. Dekpa done. Attention, also here there are often questions and inconsistencies. In our case the Dekpa would have expired on April 11th. After the extension it will NOT run until April 11, 2020, but one year after the extension date, namely only until March 22, 2020. In our case not further dramatically, but for some it might be necessary to consider that one “loses” a few days as a result. we’ll make it still today. 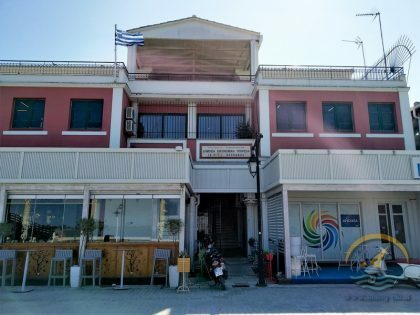 From the harbour office towards the roundabout (the one near the bridge, for those who know Lefkas) towards the coffee house strip, directly after the “Cafe Karma” the entrance is hidden. This time up to the second floor. The lady fetches the office manager (?) to translate. After some back and forth and a phone call with the Port Police she signals to follow her down to the first floor. Bright excitement, total confusion, what do they want? Voluntarily paying taxes? That’s never happened before! One of the gentlemen in the office waggles around with the appropriate form, our expectations rise. But to our disappointment we are sent away again. One of the ladies from the first floor explains to us (in sufficient good English) that we are the very first ones to ask about it, and unfortunately we can’t pay before April 2nd. We may then please come back. Well, Dekpa done, Tepah still outstanding. If I hear anything new, I’ll let you know. The introduction of the tax has been postponed to May 9, 2019. Announcement was yesterday, April 1. Many thought it was a (bad) April fool’s joke. Meanwhile, however, it has been officially confirmed. Good for us, annoying for those who have travelled to Greece just to pay the tax.